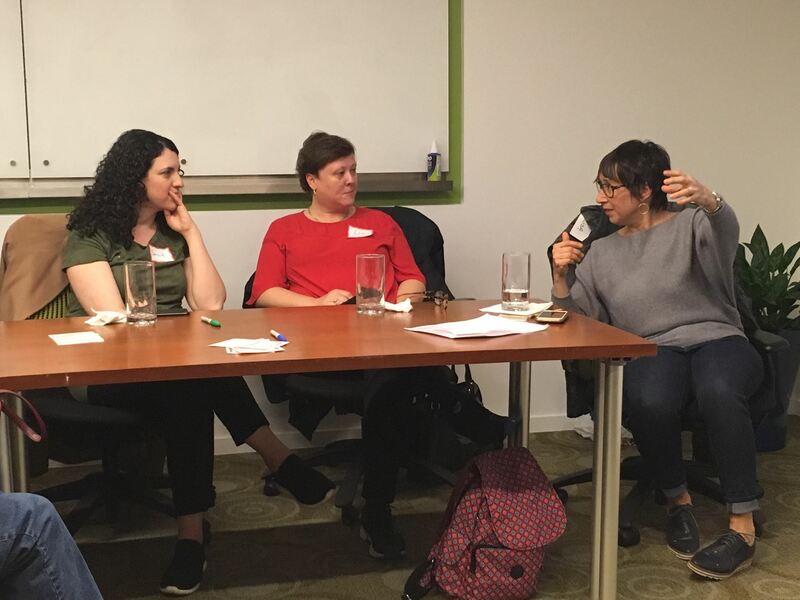 On April 9th, NYWCA members and interested members of the public gathered for a home fermentation workshop led by Myra Kornfeld at Myra’s Kitchen near Union Square. The workshop covered 4 methods of lacto-fermentation: salt only, salt + water brine, whey, and salt + whey brine. Participants sampled delicate fruit and savory beet kvass, Myra’s potent “firewater” (a delicious addition to bone broth), plus a few versions of kraut and kimchee. Myra provided a great workbook with recipes and methods using readily available ingredients and simple tools for home fermentation. Anyone can get started with just a 1-quart wide-mouth jar! Gadget lovers may also wish to invest in a wooden kraut pounder. Myra showed how easy it is to use traditional methods of preservation to transform produce into bright and boldly-flavored home ferments that support a healthy gut microbiome. Learn more about Myra at www.myrakornfeld.com. Diana Pittel and Sarah Abrams, founders of the Cocktail Club, hosted a lively and thirsty group of NYWCA members on Monday, April 8th, at the New York Distilling Company. Allen Katz, owner and distiller, shared his vast knowledge and passion for gin as we tasted and learned about three distinct styles of gin and their respective botanicals: Perry’s Tot (Navy Strength Gin with a whopping 114 proof, 57% alcohol and not one cough in the room! Spicy and intense! ), followed by Dorothy Parker (American Gin, 88 proof, an original yet classic made with juniper berries, elderberries and hibiscus petals, citrusy and floral), and finally Chief Gowanus (New Netherland Gin based on a recipe dating back to 1809, made with American rye whiskey, juniper berries and Cluster hops). 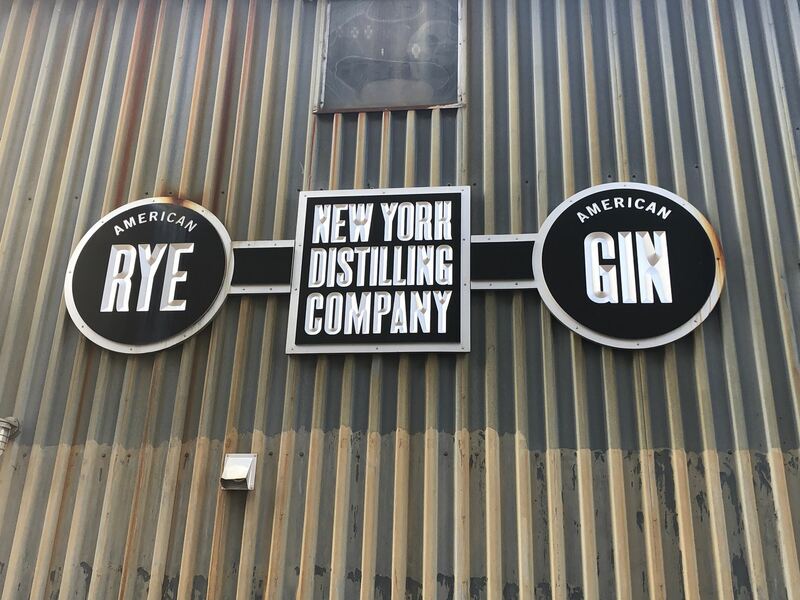 We also got to taste and experience the complexity of flavors in the actual juniper berry botanical before touring Allen’s impressive craft distillery. Finally, it was time to mix and shake! We measured, mixed and shook 2 fabulous cocktails: a Gimlet featuring Perry Tot’s gin and a New York Negroni spotlighting Dorothy Parker Gin. Cheers to a fantastic evening leaving us with a newfound appreciation for gin as the weather warms up and gin and tonics are calling out! 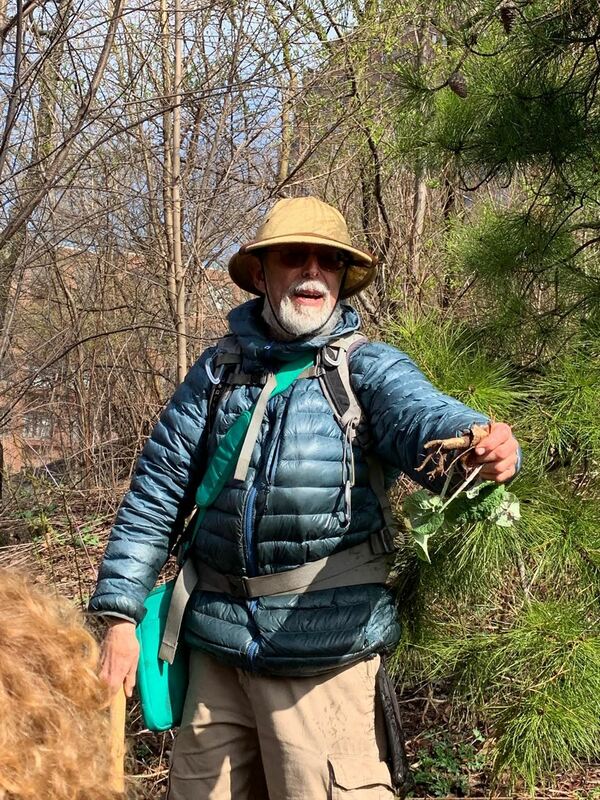 On Saturday, April 6, NYWCA members and guests soaked up some springtime rays and put their hands in the dirt to pull up some delicious treasures. Wildman Steve Brill returned by popular demand to lead this foraging tour of Central Park. 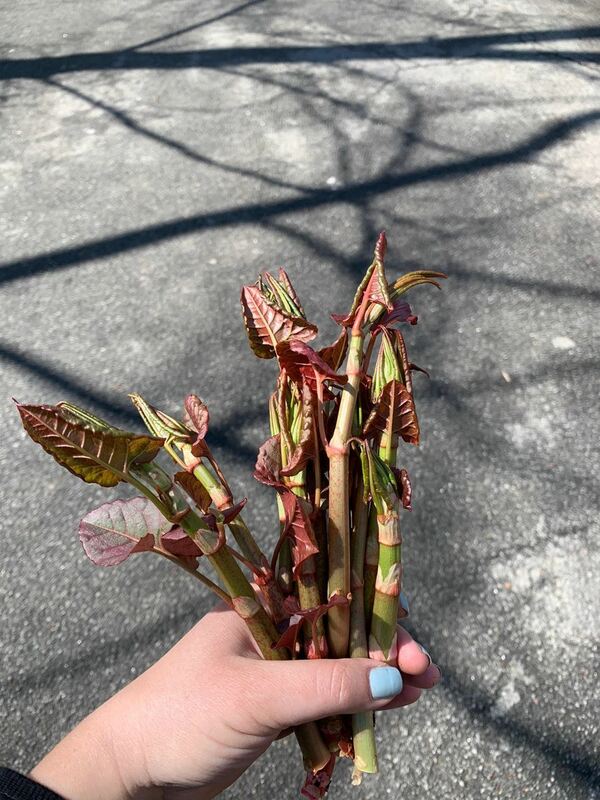 Garlic mustard, burdock root, and Japanese knotweed were just a few of the wild foods we found hiding in plain sight. Wildman Steve also brought along some foods he had prepared to illustrate the culinary applications of our discoveries– think burdock root jerky and vegan garlic mustard pesto. Adventurous cooks and eaters in the group harvested plentiful and flavorful wild vegetables for weekend cooking projects. Zoe Mikhailovich planned the event. Learn more about Wildman Steve at https://www.wildmanstevebrill.com, and find him on Twitter @wildmanbrill. 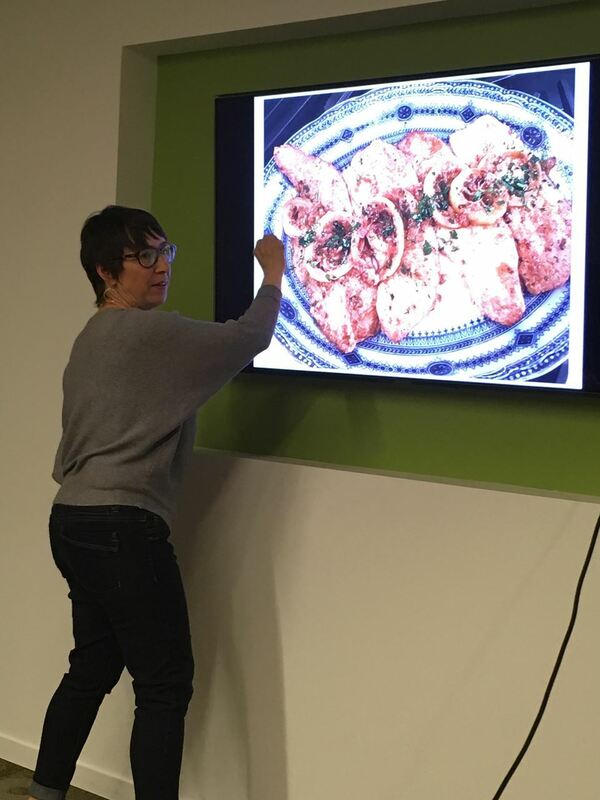 Last week, NYWCA members were treated to an eye-opening evening of lessons in food styling with styling genius, Lisa Homa. 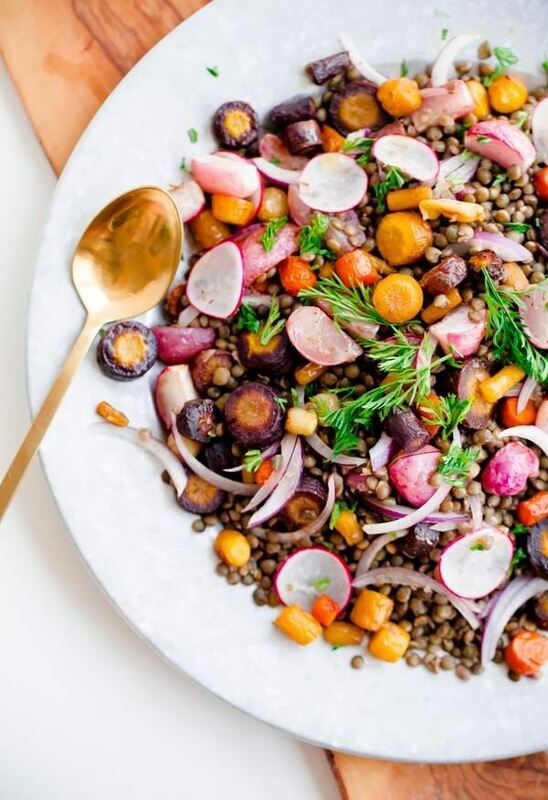 She shared her own behind the scenes expert tips on using color, texture and design as important concepts to master for the perfect food shot. Attendees who submitted their own photos were treated to a valuable critic on how to improve their own work. Best tip of the workshop was design in groups of 3’s, repetition is visually pleasing. Stay tuned, our Instagram feeds are going to be looking very delicious! A full house of enthralled listeners attended pre-Passover dinner on Tuesday, March 12, 2019 at Jennifer Clair’s Home Cooking New York kitchen. 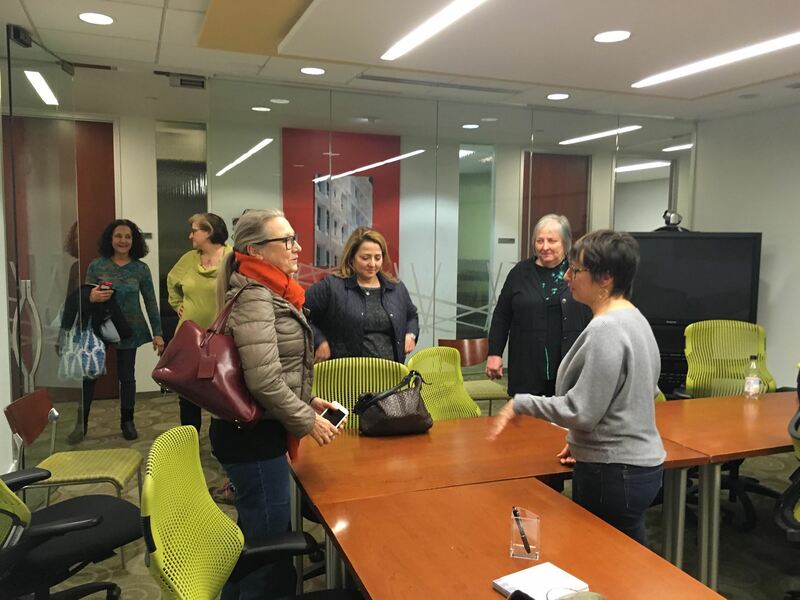 Each woman brought a traditional Seder dish, and joined Middle Eastern chef, member, author, and culinary instructor Jennifer Abadi for an evening of storytelling and to learn about the diversity of culture surrounding Passover offerings in the Sephardic and Judeo-Arabic communities. Her stories came from her historical cookbook entitled Too Good To Passover: Sephardic & Judeo-Arabic Seder Menus and Memories from Africa, Asia and Europe and spanned memories she garnered from women from Africa to Asia and parts of Europe. During this storytelling, the large group of us was sitting around a giant table tasting some delicious offerings beginning with a twist on a Syrian haroset made with dried apricots and orange blossom water, and even a balled Moroccan haroset that could have passed for truffles! This was followed by a delicious soup called Kibbeh Hamdah, a tart soup made with lamb meatballs, lemon and mint. Other highlights were a Gibraltarian-style layered matzah pie with ground beef, turmeric and nutmeg. Desserts included Egyptian walnut date macaroons and Italian Almond Cake with almond syrup. Thanks to Jennifer Abadi and Rebecca Miller French for co-hosting a warm and inviting evening, and to Jennifer for signing many copies of her lovely cookbook that will be shared with friends and loved ones. As Clare Treves Brezel has said, "Preserving the memories and the recipes is so, so very important!" Book Club: Members Eat, Drink & Discuss "Delicious!" The winter session of the Book Club gathered on January 17 to discuss Ruth Reichl’s debut novel, "Delicious!" The evening was hosted by Fanny Farkas at her charming apartment. She graciously treated those lucky enough to attend to a sit-down dinner centered around wintery fare of roast pork with fennel and pizzoccheri, a buckwheat pasta from the Italian Alps. Co-chair, Jeanne Voltz organized the event and prepared the book’s pièce de résistance, Billie’s Gingerbread (recipe below). Member Gisela Nelson provided the book’s delicious brownies. Unlike Ruth’s wonderful memoirs, most were curious but underwhelmed by her roman à clef and it quickly became secondary to the fabulous meal and great company. Thanks to all who attended, contributed and helped, especially Fanny. When the Book Club tasted Billie's Gingerbread, a majorplayer in the novel, we could understand the hoopla. It was "Delicious!" Preheat the oven to 350° F. Butter and flour a 6-cup Bundt pan. Grind your cinnamon stick and measure out 1 teaspoon. Whisk flour, baking powder, baking soda, salt and spices in a small bowl. In another small bowl, whisk eggs and egg yolk into the sour cream; set aside. Cream the butter and sugar in a stand mixer until fluffy and almost white, about 3 minutes. Add grated ginger and orange zest. Beat the flour mixture and the egg mixture, alternating between the two, into the butter until each addition is incorporated. The batter should be as luxurious as a mousse. Spoon the batter into the prepared pan and bake about 40 minutes, until the cake is golden and a wooden skewer comes out clean. Remove to a rack and cool 10 minutes. While the cake cools in the pan, simmer bourbon and sugar in a small saucepan about 4 minutes. It should reduce to about 1/3 cup. While the cake is still in the pan, brush half the bourbon mixture onto its exposed surface (the bottom of the cake) with a pastry brush. Let the syrup soak in for a few minutes, then turn the cake out onto a rack. Gently brush the remaining mixture all over the cake. Once the cake has cooled, mix the sugar with the orange juice and either drizzle the glaze randomly over the cake or put in a squeeze bottle and do a controlled drizzle. Seats were hard to come by at the Dine-Around January 7th at Yoon Haeundae Galbi NYC. The original family restaurant was founded in 1964 in Busan, South Korea, and Amy Lee, the NYWCA organizer, has been a regular at the NYC location since it opened in April 2018. The original restaurant's founder's grandson, Bobby Yoon, was the gracious host of the event. Yoon explained about his family business and the differences between this location and the one in Korea: over there people have their own individual banchan (Korean small plate appetizers) and they also take charge of their own grills. At our event, the waitstaff dexterously handled all the cooking and explained the various cuts of beef and other dishes, which included a popular soy bean-based soup, a shrimp and scallion pancake, many cuts of super tender and well marinated beef, and some particular delicacies from the bones, as well as delicious potato flour noodles finished in the beefy cooking broth around the edge of the grill. The atmosphere was festive and convivial and it was particularly nice to gather around the communal grills with fellow members while further exploring Korean cuisine. 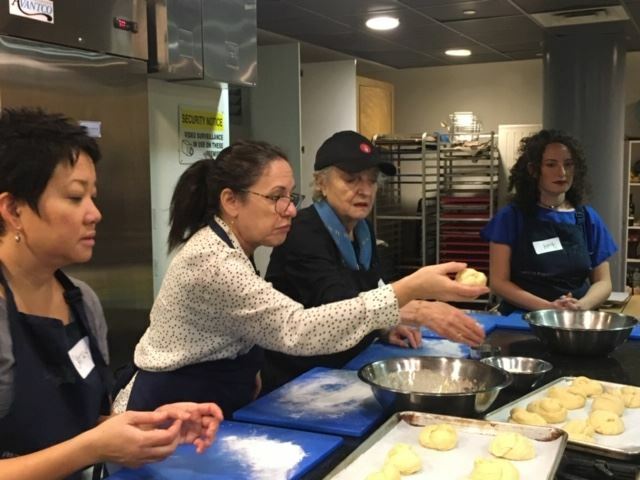 NYWCA members met on December 4, 2018 at The Marlene Meyerson JCC Manhattan on the Upper West Side to learn about challah baking and braiding – our ultimate goal was to perform a community service event in which the baked challah rolls were being donated to The New Jewish Home, a senior care facility. Irene Yager and Jackie Addy made the challah dough earlier in the morning and several batches were ready for the members to braid, shape, glaze, and bake in individual rolls. 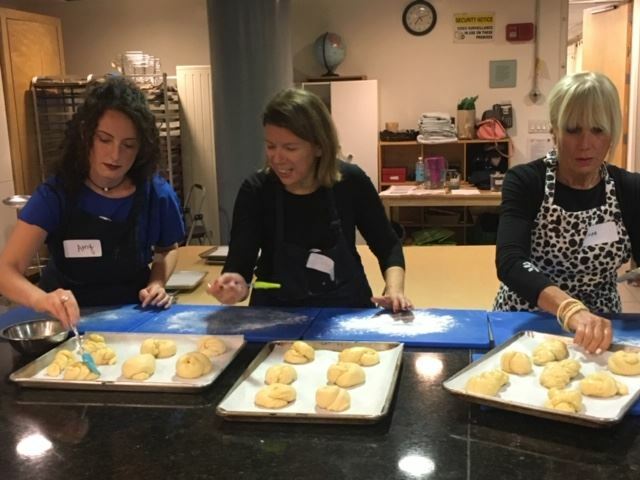 The class was led by Kate Landowne, an amazing instructor offering various tips and suggestions on baking challah. The kitchen had an amazing sweet smell of challah; we were all lucky enough to sample fresh, hot baked challah with a little drizzle of honey accompanied by a refreshing glass of kosher white wine. 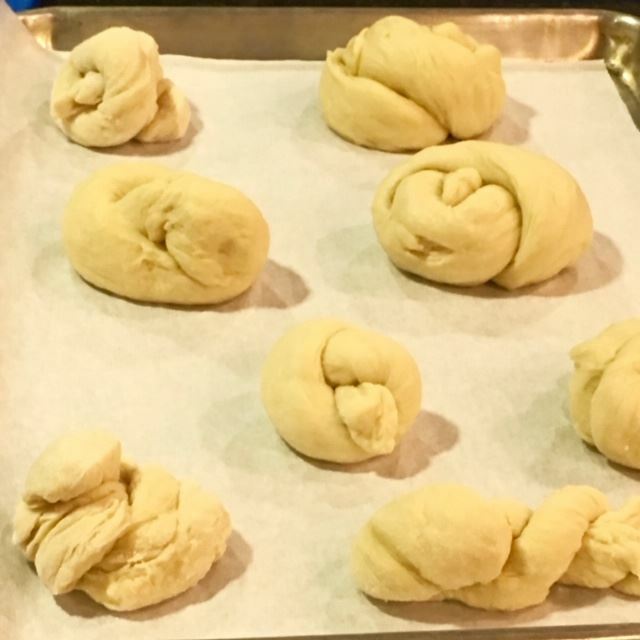 After the members finished baking the batches of rolls for The New Jewish Home, it was time to learn how to make challah dough from scratch – “Challah in a Bag.” This recipe was so simple to make – and delicious. In a 1-gallon plastic ziptop bag we added yeast, water, sugar, salt, oil, and 4 cups of flour with as little mess as possible. Then just knead the dough gently in the bag so it doesn't burst or rip. I attended several challah baking events throughout the year and this one was my favorite so far. We had a wonderful evening of baking and networking. Each member went home with the challah recipe, braiding instructions and a batch of challah dough ready for the oven! I baked my challah for Shabbat – bread was scrumptious and delicious! We mostly admitted to not being able to exactly place Macao on a map. During a convivial evening with Rosa Ross at Fanny Farkas' intimate, warmly decorated apartment, a dozen of us got a better grip on Macanese cuisine. 1. Macao was a Portugese-influenced toehold for European tea merchants, about 40 miles from Hong Kong. 2. All Macanese cuisine is derivative; influenced by Portugese and Chinese ingredients and cooking methods. 3. Our groaning board of Arroz Gordo came with a Portugese base, garnished with Macanese elements of hard boiled egg, fried shallots, croutons, and Rosa's special add-ons of roasted turmeric-rubbed pork shoulder and chicken. Rosa passed out a packet of recipes prepared for the evening's dinner party. As the group supped on Christmas Eve Shrimp Soup with noodles, Rosa filled our heads with Christmas Eves in Macao, when her mom sang solos at midnight Mass. While we dipped chips into spicy salted-shrimp Balichao, tales floated of her family's preparation five-year batches of this tabletop condiment. A stunning steamed sponge cake topped with coconut and caramel brought the evening to a sweet close, as new friends exchanged emails and Rosa autographed her cookbook, Beyond Bok Choy, for each participant. NYWCA Wine & Spirits Committee hosted the Riesling & Roti event at Saar Indian Bistro. 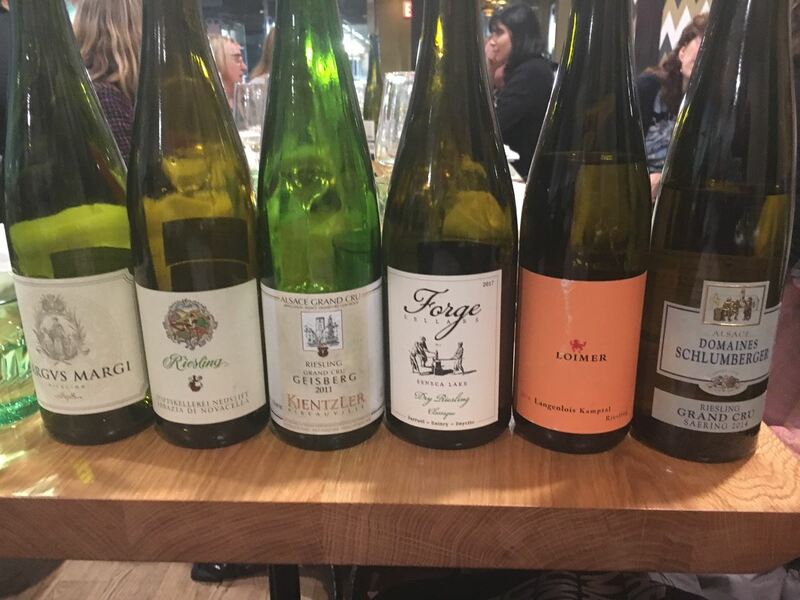 Members enjoyed six Rieslings from all over the world (from theFinger Lakes, NY to Central Serbia) paired with traditional Indian dishes. Wine experts Danica Stitz and Stephanie Teuwen selected a wide range of Rieslings to highlight the distinct and various flavor profiles of Rieslings. Guests learned that Riesling could range from bone-dry to fully sweet and that Riesling is a wine grower’s grape as it is truly expressive of its terroir. While many guests were not fans of Riesling at the beginning of the event, everyone left with a newfound love for this full-bodied wine that paired perfectly with the spicy delicious Indian food. Riesling rules! 6 fantastic Rieslings from 5 different countries.